High-temperature superconductors have the potential to transform everything from electricity transmission and power generation to transportation. The materials, in which electron pairs travel without friction—meaning no energy is lost as they move—could dramatically improve the energy efficiency of electrical systems. Understanding how electrons move through these complex materials could ultimately help researchers design superconductors that operate at room temperature, dramatically expanding their use. However, despite decades of research, little is known about the complex interplay between the spin and charge of electrons within superconducting materials such as cuprates, or materials containing copper. Now, in a paper published today in the journal Science, researchers at MIT have unveiled a new system in which ultracold atoms are used as a model for electrons within superconducting materials. The researchers, led by Martin Zwierlein, the Thomas A. Frank Professor of Physics at MIT, have used the system, which they describe as a "quantum emulator," to realize the Fermi-Hubbard model of particles interacting within a lattice. The Fermi-Hubbard model, which is believed to explain the basis for high-temperature superconductivity, is extremely simple to describe, and yet has so far proven impossible to solve, according to Zwierlein. "The model is just atoms or electrons hopping around on a lattice, and then, when they're on top of each other on the same lattice site, they can interact," he says. "But even though this is the simplest model of electrons interacting within these materials, there is no computer in the world that can solve it." So instead, the researchers have built a physical emulator in which atoms act as stand-ins for the electrons. To build their quantum emulator, the researchers used laser beams interfering with each other to produce a crystalline structure. They then confined around 400 atoms within this optical lattice, in a square box. When they tilt the box by applying a magnetic field gradient, they are able to observe the atoms as they move, and measure their speed, giving them the conductivity of the material, Zwierlein says. "It's a wonderful platform. We can look at every single atom individually as it moves around, which is unique; we cannot do that with electrons," he says. "With electrons you can only measure average quantities." The emulator allows the researchers to measure the transport, or motion, of the atoms' spin, and how this is affected by the interaction between atoms within the material. Measuring the transport of spin has not been possible in cuprates until now, as efforts have been inhibited by impurities within the materials and other complications, Zwierlein says. By measuring the motion of spin, the researchers were able to investigate how it differs from that of charge. Since electrons carry both their charge and spin with them as they move through a material, the motion of the two properties should essentially be locked together, Zwierlein says. However, the research demonstrates that this is not the case. "We show that spins can diffuse much more slowly than charge in our system," he says. The researchers then studied how the strength of the interactions between atoms affects how well spin can flow, according to MIT graduate student Matthew Nichols, the lead author of the paper. "We found that large interactions can limit the available mechanisms which allow spins to move in the system, so that spin flow slows down significantly as the interactions between atoms increase," Nichols says. When they compared their experimental measurements with state-of-the-art theoretical calculations performed on a classical computer, they found that the strong interactions present in the system made accurate numerical calculations very difficult. "This demonstrated the strength of our ultracold atom system to simulate aspects of another quantum system, the cuprate materials, and to outperform what can be done with a classical computer," Nichols says. Transport properties in strongly correlated materials are generally very hard to calculate using classical computers, and some of the most interesting, and practically relevant, materials like high-temperature superconductors are still poorly understood, says Zoran Hadzibabic, a professor of physics at Cambridge University, who was not involved in the research. "(The researchers) study spin transport, which is not just hard to calculate, but also even experimentally extremely hard to study in conventional strongly-correlated materials, and thus provide a unique insight into the differences between charge and spin transport," Hadzibabic says. Complementary to MIT's work on spin transport, the transport of charge was measured by Professor Waseem Bakr's group at Princeton University, elucidating in the same issue of Science how charge conductivity depends on temperature. The MIT team hopes to carry out further experiments using the quantum emulator. For example, since the system allows the researchers to study the movement of individual atoms, they hope to investigate how the motion of each differs from that of the average, to study current "noise" on the atomic level. "So far we have measured the average current, but what we would also like to do is look at the noise of the particles' motion; some are a little bit faster than others, so there is a whole distribution that we can learn about," Zwierlein says. 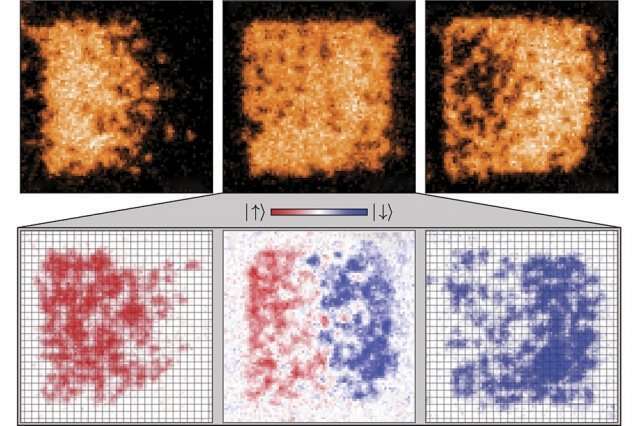 The researchers also hope to study how transport changes with dimensionality by going from a two-dimensional sheet of atoms to a one-dimensional wire.